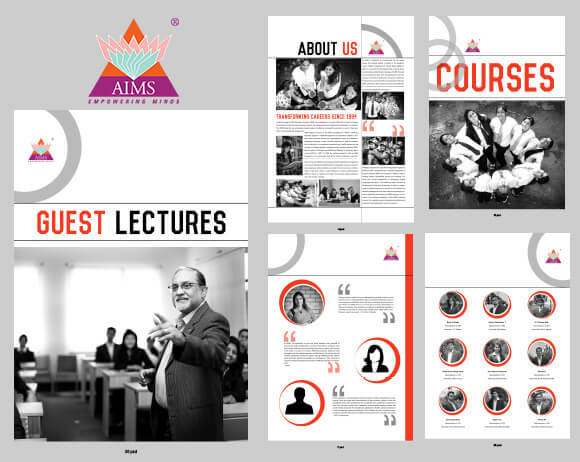 Brochure Design for Acharya Institute of Management and Sciences (AIMS) – a private, self-funded educational institute affiliated to the Bangalore University. AIMS, one of the top 6 management schools in Karnataka as per the National Institutional Ranking Framework 2017, had a requirement for brochure design to supplement their annual placement drive. The objective of the placement drive is to help students kickstart their careers by giving them an opportunity to work with some of the most respected companies in the country. Crafting Genius worked on designing the brochure and developing the content for the same. The brief was to keep the brochure informative and insightful. The aim of this brochure was to give hiring managers a fair idea of what students learned, how they fared in and what skills they developed through their courses.